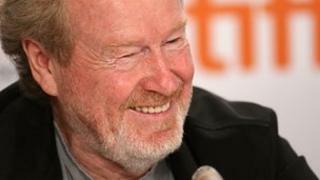 Sir Ridley Scott has joined forces with YouTube to launch an online film festival which will see 10 finalists sent to the Venice Film Festival. YouTube has launched an online competition offering budding film-makers a $500,000 (£324,000) grant to create a film with director Scott. The final ten films, as voted for by the public, will then be screened at this year's Venice Film Festival. Scott will lead a jury of industry professionals who choose the winner. "Short film-making is exactly where I started my career 50 years ago," he said. "So to be helping new film-makers find an entry point like this into the industry is fantastic." Your Film Festival will accept submissions until 31 March, when Scott's production company will select 50 semi-finalists to move on to the next round. Entrants can make the film about any subject in any genre, however the film can be no longer than 15 minutes in length and must not have been distributed prior to 1 January 2010. The competition follows a previous partnership between Scott and the website, which saw Scott create a feature length documentary, Life in a Day, from videos submitted by YouTube users.